I've managed to get my first Vyper squadron finished this last week. Even though the paintjob is quick, it carries across much better when there is more than one model together. I still need to finsh some of the other weapons so I can change them out according to my needs. But for now, all of them have scatter lasers. I will assume that those turrets are magnetized. They do look good as a group. Well not exactly magnetized, they are "pinned" in place. Each weapon has a vertical pin extending downward that fits into a small hole in the weapon mount. It's enough to keep them in place for regular gaming but gives me the option to change them out or remove them should they be "destroyed." 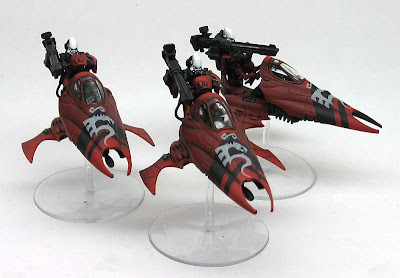 Looking very nice, I like the darker red colour you've got on your Saim-Hann stuff. Great work Ron! These are coming together quickly and look fantastic. Yeah- the colorsheme works fine in groups. Good work on the freehands as well. Another thing: is it only me or is the new template croaked as the Blogger group list is waaaay down the site? lookin' good Ron, lookin' mighty good indeed. I love the way they look all together!! Now the question is how many more do you have to do? Thanks guys, I've got one more squadron of 3 to finish. Hopefully in the next couple weeks I can get them done.